It was one of those perfect summer evenings when just being alive to enjoy the beauty would be reward enough. However, on this midsummer evening I was even more fortunate to find myself with my fishing partner, Zeke, on the banks of our favorite trout stream, and it appeared that we were completely alone. "Up or down?" I said to Zeke. "I'll go up," he replied. "On a night like this I think that Pine Tree Flat should be alive with rising fish. I'll meet you back here later." "I'll leave the spare key on top of the right rear tire in case you get back before I do." I knew that was unlikely since Zeke had a tendency to continue to fish as long as there was one fish rising anywhere in his vicinity. As Zeke disappeared into the woods I placed the spare key on top of the tire and headed off downstream. It was indeed a wonderful evening. A hatch of small cream colored mayflies with just enough intensity to keep the trout interested, and a cloud of spinners forming at tree top level held the promise of a great spinner fall just about dark. I had just finished making some adjustments to my leader, and was preparing to tie on a fly when I heard someone or something coming down through the woods. Whoever was approaching was not making any attempt at being quiet, and I was uncertain who or what it was that could be making such a noisy approach. Just then Zeke appeared out of the brush almost on a dead run. "What's with you?" I said. "You look like you've seen a ghost or worse." "Worse," he gasped. "There's a gosh-darn female person up at Pine Tree Flats." Now Zeke liked women, in fact he was married to one of the nicest ladies you would ever want to meet, but in Zeke's mind members of the feminine gender had their place, and it wasn't on a trout stream. "There's a woman swimming at Pine Tree Flats?" I asked. "Why it's hardly deep enough to swim up there." "Did I say she was swimming?" Zeke retorted. "She ain't swimming, she's fishing. Big as life I tell ya. Right where I always fish. She's all decked out in waders, vest, the whole shooting match. I thought it was some guy until I got close enough to see better, and I'll tell you it's a girl alright. Ain't no doubt about that!" "So, she's fishing. From your description it certainly seems that she has all the proper equipment, and it seems like she has the right to be there. This is public water." "She ain't got no right to be there. She should be at home cooking, or cleaning or something. A woman's place is in the home." "Well, why don't you go back up there and tell her that? Just tell her to get on home, and out of your fishing spot. That should do it." "You out of your mind? You expect me just to waltz up to her and tell her to get off the stream? I can't do that." "You just told me that she has no right to be there, and that she belonged at home. I'm just suggesting that you tell her what you told me. Now I didn't come here to discuss where a woman's place is, so if you will excuse me I have some trout to catch." The fishing was wonderful that evening. 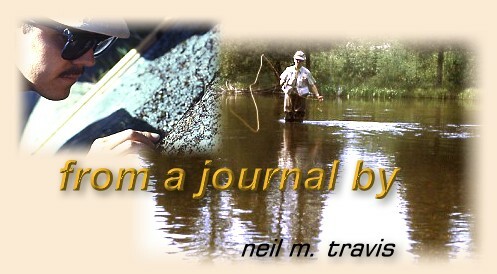 The cream colored mayflies continued to hold the trout's interest until the spinners began to hit the water, and the trout continued to rise steadily until it was completely dark. I'd nearly forgotten about Zeke, and as I made my way back to the car I wondered if he had found some other place to fish, or if he had gone back to the car to pout about a woman in his fishing hole. When I got to the car and Zeke was nowhere in sight so I figured he had found someplace to fish for the evening. The key was still on top of the rear tire, and I unlocked the car and began to stow my gear. I had just finished removed my waders when I heard Zeke coming up the trail. "Watch your step" I heard him say. "There's a hole and a root sticking out of the ground." Zeke came walking up the trail holding his flashlight, and talking to someone that was following behind him. Except for me and a couple other fishing buddies Zeke was pretty much of a loner when it comes to outdoor things, so I was a bit surprised to see him coming up the trail accompanied by another person. Zeke stepped into the clearing, and nearly bumped into me in the dark. "Oops. I didn't see you standing there. I thought you might still be out on the stream." "Well it is kind of dark," I said. "Who's your friend?" "Oh, this is Dawn. She's the person I spoke to you about earlier. She's quite an angler, and we had a good evening on Pine Tree Flats." In the dark Zeke's foot found my shin and I got the idea that any comment about his feelings about female anglers would not be appreciated at that moment. "Dawn, this is Neil, my old fishing partner." Not waiting for me to acknowledge the introduction Zeke went on to explain that Dawn's vehicle was parked at the bridge, and he had told her that since it was so dark we would give her a ride to her car. Besides it was right on our way, and it really was not a bother. I started to say that we never take that route, but Zeke gave my shinbone another quick shot with his foot and I decided that discretion was the better part of valor. As we drove away it was obviously that he was afraid that I might say something so Zeke kept up a non-stop monologue until we arrived at her car. "Thank you for the ride," she said, "and thank you Mr. Zeke for all your help on the stream tonight. It really was nice of you to be so helpful. I hope we can do it again sometime soon." We waited in silence while she loaded her gear into her car. In our headlights I could see that she was a petite blond with a face and a figure that most men would deem attractive. She waved as she drove away. "What in the world was that all about?" I said, stifling a laugh. "I thought...."
Zeke cut me off in mid-sentence. "Don't say another word, and don't breathe a word of this to my wife. Anyway it's all your fault." "All my fault! How do you figure that?" "Well, I went back up there just like you said, and I intended to have some words with her, about a woman's place and all that. When I got back up there she was fighting a real nice brown, and she didn't have a net so I helped her net it. Just trying to be friendly and all. She thanked me for helping her and then she suggested that I try for another trout that was rising. One thing just lead to another, and before I knew it we were walking out together in the dark. Believe me, she is one heck of an angler." "What ever you say Mr. Zeke. You always have been so helpful." No longer able to contain myself I began to laugh, and I laughed so hard that tears began to roll down my face. "Mr. Zeke," I gasped, 'I hope we can do this again sometime soon."